How cool, right? After seeing the premiere last night (thoughts anyone? It was good but for some reason I'm not completely blown away...Maybe my expectations were too high? That being said I am sure this season will be amazing), wouldn't it be awesome to have this!? I think it's easy to build our expectations because we have the media drumming so much hype prior to the occasion...I'm not a LOST fan...but can see where you're coming from...Have a wonderful day Jaime. Wow that competition sounds awesome. I really need to watch lost. I would love to have that USB!!! 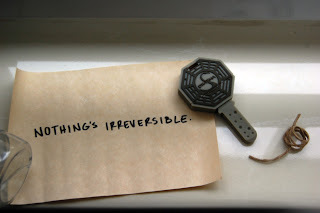 I loved when Jack said, "nothing is irreversable". That being said I was terribly confused last night. I'm a casual Lost watcher, and I'm sure that was the problem. I think I need to go watch a few more episodes from last season before next week. That is really cool. I only watched one season, but imagine this being really neat.